The Howard family, Dukes of Norfolk, claim the heroic Hereward the Wake, who led Saxon resistance against William the Conqueror, as their ancestor. However the recorded descent of the family commences in the thirteenth century with one Sir William Howard, a judge who served in the House of Commons in the Model Parliament of 1295 during the reign of King Edward I. 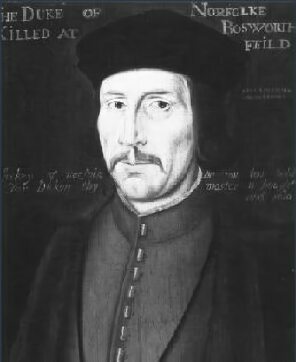 His son, Sir John Howard, became Sheriff of Norfolk and Suffolk. Sir John was married to Joan de Cornwall, daughter of Sir Richard de Cornwall, illegitimate son of Richard Plantagenet, 1st Earl of Cornwall and King of the Romans. Sir William's three greats grandson Sir Robert Howard was married to Lady Margaret Mowbray, the elder daughter of Thomas Mowbray, 1st Duke of Norfolk (1366-1399), Lady Margaret was the great great granddaughter of Thomas of Brotherton, 1st Earl of Norfolk, who himself was the son of Edward I, by his second wife Margaret of France. The male line of the Mowbray Dukes of Norfolk became extinct in 1476 with the death of of John Mowbray the 4th Duke, his daughter and heiress Anne Mowbray, who was married to Richard Duke of York, the second son of Edward IV, died at the age of nine in 1481. “Jack of Norfolk, be not too bold, For Dickon, thy master, is bought and sold". Norfolk commanded the vanguard of the king's army in the battle, his son, Thomas, Earl of Surrey, fighting alongside him. John Howard was slain when an arrow struck him in the face after his face guard had been ripped from his helmet during an earlier altercation with the Lancastrian commander, John de Vere, Earl of Oxford. His son Thomas was wounded during the battle and after the death of Richard III made his submission to the new Tudor king, Henry VII. He was promptly arrested and attained in the first Parliament of the new reign, stripped of his lands, he was imprisoned in the Tower of London, where he remained for the following three years. 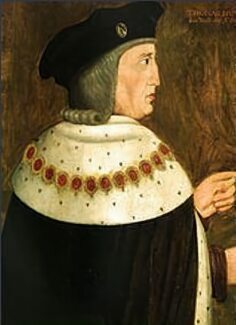 Henry VII eventually restored Howard to the Earldom of Surrey. In the reign of Henry's son and successor, Henry VIII, he led the English forces to a resounding victory against an invading Scottish army at the Battle of Flodden, on 9 September 1513, where James IV, King of Scots was killed. On 1 February 1514, having proved his loyalty to the Tudor dynasty, Howard was created Duke of Norfolk. The 2nd Duke married twice, firstly on 30 April 1472 to Elizabeth Tilney, the daughter of Sir Frederick Tilney of Ashwellthorpe, Norfolk, and widow of Sir Humphrey Bourchier, and secondly on 8 November 1497 , to her cousin, Agnes Tilney, the daughter of Hugh Tilney of Skirbeck and Boston, Lincolnshire and Eleanor, a daughter of Walter Tailboys. He lived to reach eighty years of age, dying on 1 May 1524. 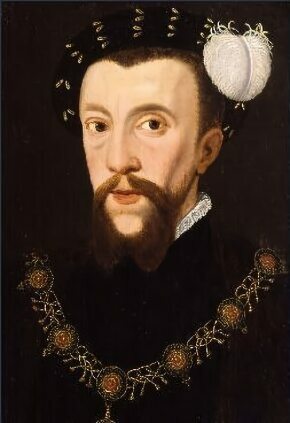 He was succeeded as Duke of Norfolk by his oldest son, also named Thomas. 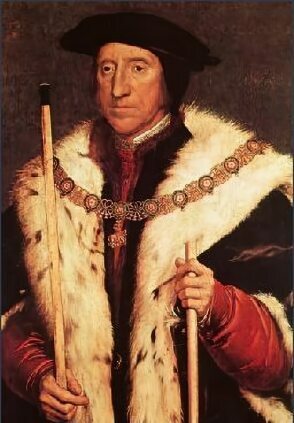 Thomas Howard, 3rd Duke of Norfolk, was born in 1473, the eldest son of the 2nd Duke of Norfolk, and his first wife, Elizabeth Tilney (d. 1497). On 4 February 1495 he married Anne of York (1475-1510), the fifth daughter of King Edward IV and later the sister-in-law of King Henry VII. The marriage produced four children, none of whom survived to reach adulthood. After Anne's death in 1510 he married for a second time to Lady Elizabeth Stafford. King Henry VIII became infatuated by Norfolk's niece Anne Boleyn, Anne was an attractive woman with dark hair, olive complexion, beguiling French ways, and a vivacious personality, but her most striking feature was her eyes, which were large dark and lustrous. Henry wished to obtain an annulment of his marriage to Katherine of Aragon to enable him to marry Anne and ensure the Tudor succession with a son. By 1529 matters of state were being increasingly handled by Norfolk, Suffolk and the Thomas Boleyn, the father of Anne, who influenced the King to remove Cardinal Wolsey. In November Wolsey was arrested on a charge of treason, but died before he cold face trial. Norfolk greatly benefited from his fall from power. Henry and Anne were eventually married and Anne crowned queen, however, she failed to produce the son Henry so ardently desired and wishing to be free to marry again, Henry had Anne arrested and charged with adultery and treason. As Lord High Steward, Norfolk presided at the trial of his niece, in May 1536. Anne was sentenced to be burned or beheaded at the king's pleasure. Following Anne's execution her parents Thomas Boleyn and Elizabeth Howard retired to Hever Castle in the country, Elizabeth Howard died only two years after her two younger children, her husband died the following year. Having learned nothing from the sorry fate of Anne Boleyn, in a bid for power, the Duke of Norfolk, flaunted his nubile and attractive niece, Catherine Howard, before the King. Catherine was the teenage daughter of Norfolk's brother, Lord Edmund Howard and Joyce Cullpepper. Henry was smitten by the exquisite Catherine and had his marriage to his fourth wife "that great Flanders Mare" Anne of Cleves annulled on the grounds that she had a pre-contract with the Duke of Lorraine. The King married Catherine Howard and well pleased with his new wife, the doting Henry regained some of his lost youth with his lively and vivacious fifth spouse. His "rose without a thorn", unknown to Henry, had already acquired a reputation, promiscuous from adolescence and manipulated into a marriage with an obese and decidedly middle aged man to satisfy her uncle's lust for power and influence, she foolishly and dangerously continued to stray after her marriage. The Protestant element at court seized their chance and pounced. The king was informed and Catherine, arrested for her affairs, became hysterical. The cuckolded Henry immersed himself in self pity at his treatment by the woman he had so loved. He announced that of all the wives he had,"not one of them had put herself out to be a comfort" to him and woefully cursed his ill fortune at "meeting with such ill conditioned wives". The teenage Catherine was tried for high treason and followed her cousin Anne Boleyn to the Tower and the block. She regained her composure prior to her execution and asked for a block to be brought to her, where she indulged in the macabre exercise of practicing laying her neck on it. Her execution took place on 13 February, 1542, she was reported to have "died well". Catherine was buried beside Anne at the Chapel of St. Peter ad Vincula within the Tower. Several other members of the Howard family were sent to the Tower, including Norfolk's stepmother, the Dowager Duchess of Norfolk. However, the wily Norfolk managed to weather the storm and survived with his estates and titles. Norfolk's oldest son Henry Howard, Earl of Surrey was one of the first English poets to write in the form of sonnet later used by William Shakespeare. His second daughter Mary Howard was married to Henry FitzRoy, Duke of Richmond, Henry VIII's illegitimate son by Bessie Bount. During the closing years of Henry's name, the king became increasingly paranoid, the Earl of Surrey, was at this time foolish enough to quarter his arms with those of Edward the Confessor, thus boasting of his Plantagenet descent. Henry, of a suspicious turn of mind even at the best of times, struck out savagely. Both Surrey and Norfolk were arrested and sent to the Tower. Surrey was beheaded and Norfolk, under sentence of death, was spared only by the king's own death the night before his intended execution. The Duke remained in the tower throughout the reign of Edward VI, but was released and restored to his dukedom by the Catholic Queen Mary I in 1553, but died the following year. He was succeeded by his grandson, Thomas Howard 4th Duke of Norfolk, son of the executed Earl of Surrey. During the reign of the new Duke's cousin, Queen Elizabeth I, Norfolk was imprisoned in 1569 for planning to marry the Catholic Queen of Scots. Although Elizabeth later allowed his release, he participated in the Ridolfi plot with King Philip II of Spain to put Mary Queen of Scots on the throne and restore Catholicism to England and was executed for treason in 1572. Norfolk was buried at the Chapel of St Peter ad Vincula in the Tower of London. His lands and titles were forfeit to the crown, the title of Duke of Norfolk was restored, four generations later, to Thomas Howard and continues to the present day. 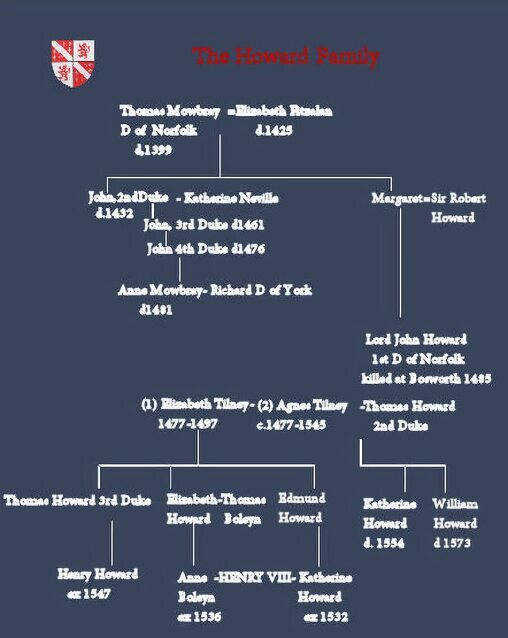 Male line descendants of the Howard family also hold the Earldoms of Carlisle, Suffolk, Berkshire and Effingham.